ARIZONA SNOWBOWL ANNOUNCES NEW LIFT FOR 2017/2018 SEASON! Arizona Snowbowl’s new quad chairlift is the third new lift in three consecutive years. Snowbowl is replacing the existing Hart Prairie Riblet double chairlift with a new Doppelmayr quad chairlift. The double chairlift was originally installed in 1981. The new fixed grip lift will seat four and includes restraining bars, footrests, and padded seats. Construction will begin mid-June and the new lift will be open for the 2017/2018 ski season. THIRD NEW LIFT IN THREE YEARS! 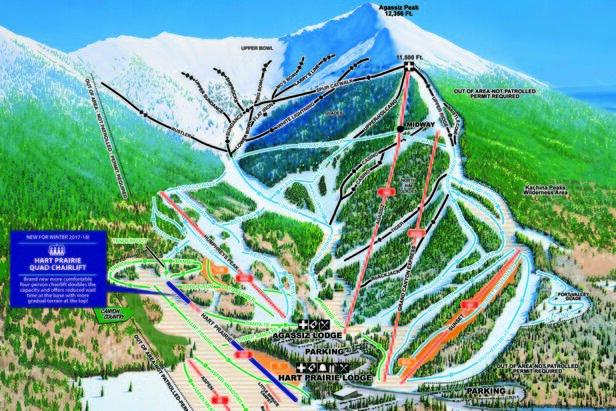 Flagstaff, Ariz. -- Officials at Arizona Snowbowl announced the resort is installing a new lift for the 2017/2018 ski season, which is part of a $15 million capital improvement program for the 2017/2018 season across five mountains: Arizona Snowbowl, Purgatory Resort, Sipapu Ski & Summer Resort, Pajarito Mountain, Hesperus Ski Area, and Colorado’s largest snowcat skiing operation, Purgatory Snowcat Adventures. The Southwest’s largest ski area collective has invested a grand total of $35 million over three consecutive seasons. Arizona Snowbowl’s new quad chairlift is the third new lift in three consecutive years. Snowbowl is replacing the existing Hart Prairie Riblet double chairlift with a new Doppelmayr quad chairlift. The double chairlift was originally installed in 1981. The new fixed grip lift will seat four and includes restraining bars, footrests, and padded seats. Construction will begin mid-June and the new lift will be open for the 2017/2018 ski season. The new Hart Prairie quad has an uplift capacity of 1,800 people per hour, which is double the capacity of the older double chairlift it is replacing. The length of the lift is 2,533 feet with a vertical of 518 feet. The Hart Prairie chairlift replacement was approved in the 2005 Master Development Plan by the Coconino National Forest. The new quad will also feature Arizona’s first loading conveyor, which is similar to a moving sidewalk and designed to make loading the chairlift easier and more efficient. The conveyor simply moves the skier along the loading zone, and when the chair approaches, the skier is smoothly swept up and seated in the chair. Arizona Snowbowl is known for having the best learn to ski and snowboard progression terrain in the western U.S. Snowbowl’s Hart Prairie area boasts a wide-open and gentle meadow that allows beginners to learn and gain confidence on the slopes. Hart Prairie has two chairlifts and two surface conveyors just for beginners, which offers terrain-based learning. Snowbowl is also upgrading its equipment rental fleet, improving its youth lessons, and employing state-of-the-art teaching methodology that includes terrain-based learning techniques. With the addition of the four-person Humphreys lift in 2015, the Grand Canyon Express six-person high-speed lift in 2016, and the Hart Prairie quad in 2017, the overall uphill capacity at Arizona Snowbowl has increased by 85 percent or almost double in the past three years alone. Snowbowl’s new quad chairlift is part of an aggressive $15 million multi-mountain improvement campaign for the 2017/2018 season across five ski areas, for a grand total of $35 million over the past three seasons. Other projects this year include new trails, enhanced snowmaking, a new mountain coaster, and more summer activities at Purgatory Resort (CO), Sipapu Ski & Summer Resort (NM), Pajarito Mountain (NM), and Hesperus Ski Area (CO). For more information, visit the website. Guests can enjoy all the improvements across all five resorts with a single season pass. The 2017/2018 Power Pass is currently on sale through August 4. Power Passes offer a variety of ways of purchasing, including a no-interest payment plan, which offers nine months at lower payments when purchased by June 15. Alternatively, lock in the current prices with a $99 deposit, which is applied to the overall purchase. Payments using the price lock program are due by September 15, 2017. For more information on the Power Pass, visit Snowbowl’s website. Snowbowl is currently open daily for summer operations, with scenic chairlift rides and views of the Grand Canyon and Northern Arizona and interpretive talks by Forest Service Rangers. Snowbowl is open extended hours on Fridays for the Sunset Music Series, which feature live music on the Agassiz deck and special taco dinners. For more information on the scenic chairlift and special events, visit Snowbowl’s website. For more information about Arizona Snowbowl, visit ArizonaSnowbowl.com or @AZSnowbowl on Facebook, Twitter and Instagram. Founded in 1938 and known for offering the best beginner terrain in the Southwest, Arizona Snowbowl is one of the oldest continually operating ski areas in the country, and is the first to open and last ski area to close in Arizona. Located 14 miles north of Flagstaff, Arizona, on the San Francisco Peaks and on the highest mountain in Arizona (Humphreys Peak at 12,367 feet), Arizona Snowbowl offers more than 40 trails and 2,300 vertical feet on 777 acres with eight lifts, three terrain parks and two mountain lodges. With exceptional backcountry access and tree skiing in the winter, Arizona Snowbowl also offers a world-renowned summer scenic chairlift that provides stunning views of the red rocks in Sedona, the cinder cone volcanic field, and the rim of the Grand Canyon. In the summer, Snowbowl offers scenic chairlift rides, live music, and other events. For more information, visit www.ArizonaSnowbowl.com. Also see Facebook.com/AZSnowbowl and Twitter.com/AZSnowbowl. Want more content like this? Subscribe to our newsletter! Thank you, you have been subscribed!